A few weeks ago, France was shocked to see how extremely violent the ‘banlieues’ (the suburbs around Paris) had once again become when a video of a group of youngsters attacking another with iron bars went viral (see our related coverage). This time around the uproar is over a 15-year-old who pulled an air gun to his teacher in Paris as he did not want to be put on the presence list as ‘absent’ for the course. Related coverage: <a href="https://thegoldwater.com/news/38184-Bienvenue-En-Banlieue-Paris-Violence-Level-Shocks-France-Video"> Bienvenue En Banlieue! - Paris Violence Level Shocks France (Video)</a>. 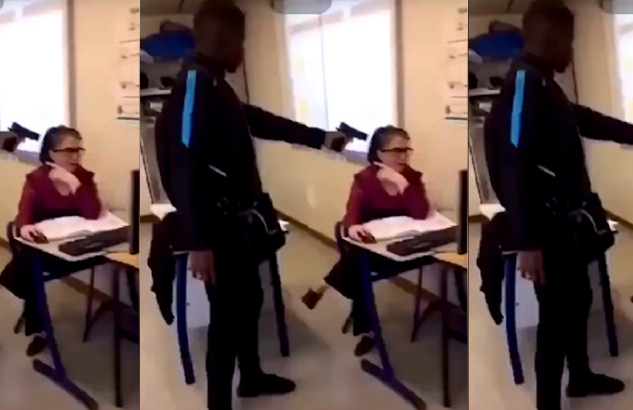 In the video which has been going around on social media over the weekend, the 15-year old was one from a group of youngsters in Créteil (Parisian suburb) who entered into class around 10 am only. Seeing that the female teacher had put him as absent for the first hour, he pulled an air gun and pointed it at her, demanding: “Tu me mets présent” ("You've marked me absent. Mark me as present"). Another student also tries to plead his case with the teacher. By now, the teenager brandishing the air gun at his teacher has been charged with aggravated assault. The incident near Paris has triggered outrage from several lawmakers, including President Emmanuel Macron. Both the Interior Minister Mr. Castaner and French President Emmanuel Macron have reacted to the footage. "School is the cradle of the Republic and it is where we learn to respect the Republic," Interior Minister Christophe Castaner said during a visit to a police station in eastern Paris on Sunday when asked by the press about the incident. He promised to "recapture the Republic square meter by square meter" from lawless elements in the banlieues. Meanwhile, French President Emmanuel Macron stated that threatening a teacher was "unacceptable" and that he had ordered his ministers to take "all necessary measures" to prevent a repeat incident. The teacher herself did not react but a colleague of her, Mr. Didier Sablic, said the school was "not used to these types of incidents", adding that students were taught "communication skills and respect." The UN, Democrats and Obama are destroying safe, clean, white countries. The arabs and others are not practicing abortion like most of the EU the USA. Their population will overflow in both. Math is on their side. ",,,, respect the republic." ?? don't you mean 'School is where you learn to become globalist drones and hand puppets for unelected beaurocrats?' At least the Aussie's had the nerve to admit institutionalized Child Fuckery (and it's not ended). Just like my drug addled brother was a model for what I didn't want to do with my life, Europe is that example for the USA. Watch and learn America.